Yep...faster faction for every two..that finishing time was pretty strong on a new surface after travel.. Here are some photos of his work from Bloodhorse facebook page. I love Jrs depth of girth and shoulder assembly. Go, Jr, Go! Post Position 9 for Chrome, according to a poster on CC Facebook page. Keep him outside of trouble...happy about that. The Jockey Club Tour on FOX Sports 1 will broadcast the $10 million Dubai World Cup (UAE-I) live from Meydan Racecourse March 28. The program, which will include a replay of the $6 million Dubai Sheema Classic (UAE-I), will air from 12:30-1:30 p.m. EDT on FOX Sports 1 and FOX Sports Go. The telecast will feature live interviews conducted in Dubai by analyst Simon Bray as well as commentary and color from Greg Wolf, Richard Migliore, Andy Serling, and Alyssa Ali in the FOX Sports studio in Los Angeles. SALUTOS AMIGOS, one of the favorites for the Golden Shaheen, did not train Wednesday morning. Salutos Amigos arrived here earlier than the other American ship-ins, landing in Dubai on March 17. He has been galloping steadily on the main track in recent days, but did not make an appearance Wednesday. "I gave him the day off today," said trainer David Jacobson. Asked if Salutos Amigos's morning confined to the barn had come up unexpectedly, Jacobson said that the lack of activity "was on the schedule." Salutos Amigos has won four races in a row. Jacobson wavered on sending the horse here to Dubai for the Golden Shaheen before eventually deciding to make the trip. PRAYER FOR RELIEF had a breeze on the Meydan dirt track Wednesday as he prepares for the Godolphin Mile on Saturday night. His situation is unusual. Trained by Dale Romans in the U.S., Zayat Stables sent Prayer for Relief to Dubai to stable with de Kock and run in the Godolphin Mile. De Kock said he has tried to keep Prayer for Relief on the same sort of schedule to which he'd adhere had he not switched barns for this race. "He's had some foot issues since he came over, but I think we have them sorted out," de Kock said. "He's a lovely horse. I was very pleased with him today." EPIPHANEIA wasn't asked to do a lot on dirt, meaning rushing to judgment would be rash, but he did not gallop over the surface like a horse that is going to love dirt in his first try over it Saturday night. HOKKO TARUMAE visited the gate, looked all right, not especially striking, and probably is outclassed in any case. LEA galloped at a moderate tempo and looked better to me the first time he went past than the second. If he has lost any weight travelling it's sure not apparent, because he's in fine flesh with a radiant coat. Considering the light workload, he did get a bit hot today on a fairly cool morning. SIDE GLANCE has been galloping on the training track, and is sporting bubble screen blinkers, something I don't remember seeing in his past trips to Arlington. He went a faster pace today than yesterday but dirt remains a major question mark. From what I've heard, Lea is looking better than Chrome on the Meydan track. It'll be really interesting to see if he upsets Chrome in the DWC tomorrow. 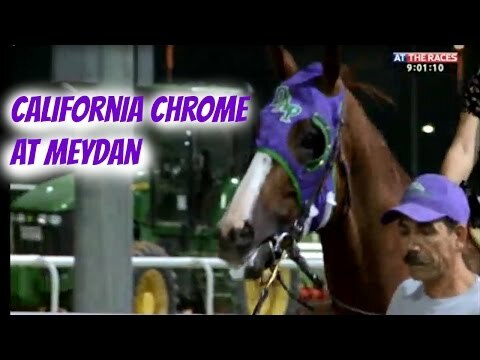 Lea certainly looks the main threat to chrome with African story right there. Lea still has to prove he can get this distance, though his pedigree says he can. Really like the speed drill he did this morning to really tighten him up. I'm getting nervous as the race draws nearer.